Bakery on Main, the gluten free company that has brought us excellent gluten free granola, is debuting a new line of products. 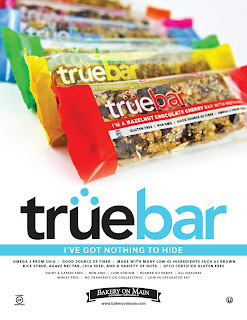 These delicious new bars contain omega 3s (from Chia), are a good source of fiber, are certified gluten free and are made using many low-GI ingredients! 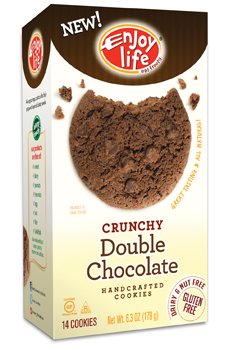 They are also dairy and casein free, non GMO, low sodium, kosher, contain no transfats or cholesterol and are low in saturated fat. For more information, stay tuned to their website at www.bakeryonmain.com. I came across a recipe for a Gluten Free Quinoa Salad with Lime Ginger Dressing a while ago in the New York Times Health Section. I finally got around to making it last week! It's a perfect cold dish to make on a hot summer day when you want to eat light! In a small bowl, whisk together all of the "dressing ingredients" including the lime juice, rice wine vinegar, ginger, garlic, salt, cayenne, sesame oil, canola oil and buttermilk. In a salad bowl, combine the quinoa, scallions, cucumber, and cilantro. Toss with the dressing and divide among salad plates. Top each portion with 3 to 4 shrimp. If you are short for time, you can make the quinoa up to 4 days in advance and store in the refrigerator and you can make the dressing a few hours ahead. Not too long ago, I came across this recipe for Pappardelle with Baby Spinach, Herbs, and Ricotta. It was featured on the cover of the April 2011 issue of Cooking Light Magazine. It looked easy enough to convert to a gluten free recipe (I just had to substitute gluten free pasta), so I tried it out. Cook gluten free pasta as per directions on label adding 1 tablespoon kosher salt. Drain. Save 1 cup of pasta water and put aside. Combine 1/2 cup pasta water and ricotta cheese in a blender. Now mix together the hot pasta, cheese mixture, spinach and remaining ingredients in a large bowl. Add additional pasta water to moisten if needed. Since everything has to be put together quickly once the pasta is ready, I recommend having all of the herbs chopped up ahead of time. I recently received a package from GoPicnic, a company that produces ready-to-eat meals. They cater to those on special diets including gluten-free, vegetarian, vegan and kosher diets. They also put together a variety of care packages which are great to send someone on a gluten free diet. These care packages include the themes: Kids Fun Food, Endurance, and Energy Boost. I was previously unfamiliar with the Joseph Banks brand of cassava chips but they turned out to be delicious! I also loved the Tasty Brand organic fruit snacks! However, everything was quite good! For more information, please visit their site at www.gopicnic.com or follow them on Twitter or Facebook. Congratulations to the 3 winners! You will each be receiving a free product coupon from Mi-Del! Send a letter to the FDA! Spread the word in-person and through social media! For more information, visit 1in133.org or visit the link in the upper right hand corner of this webpage. Enjoy Life's New Chocolate products! In addition to all of the great products and recipes, we told you about Ms. Michelle who hosted a gluten free "Brew & Chew" at The Cortland in Bay Shore, New York and who also last weekend opened her own store in Bayport, New York called Ms. Michelle's Urban Gourmet. For more information, check out her Facebook page. I've also told you about a delicious gluten free bakery in Huntington, New York called Wild Flours Bake Shop! I really recommend you check it out soon! As for this month, we have several more great gluten free products to share with you along with some delicious gluten free summertime recipes! Next month, we will be sharing with you some great restaurants and bakeries in San Francisco that cater to a gluten free audience! Enjoy the month of June!